Recent molecular evidence has proven that New World barbets, toucans, and these two birds in Semnornis (e.g., the toucan-barbets) are more closely related to each other than they are to Old World barbets (Burton 1984, Prum 1988, Sibley and Ahlquist 1990, Lanyon & Hall 1994, Barker & Lanyon 2000, Johansson et al. 2001, Johansson & Ericson 2003, Moyle 2004). Given the evidence that toucans are actually 'big-billed New World barbets' when compared to barbets in the Old World, there are several different taxonomic approaches. The Handbook of the Birds of the World (Short & Horne 2002) stuck with the traditional approach at the time— two families: all the barbets (including these Toucan-Barbets) in a barbet family and the toucans in a toucan family. Since then the consensus is a five-family arrangement: three barbet families, the toucans, and the toucan-barbets. This approach was taken by the South American Checklist Committee, noting that "genetic data indicates that Semnornis may be basal" to both Neotropical families (Barker and Lanyon 2000). In short, to accurately represent the relationships of what used to the Barbets and the Toucans, we now have five separate lineages and five separate families, including the Toucan-Barbets [Semnornithidae]. They are a special, unique, and highly sought group. My distant backlit photo (right) is how one more typically sees the Toucan-Barbet, high in the canopy of a Cecropia canopy, where one glimpse just a touch of the brilliant reds & yellows, offset by soft grays, that characterize its plumage. They love fruiting trees — indeed, Remsen et al. 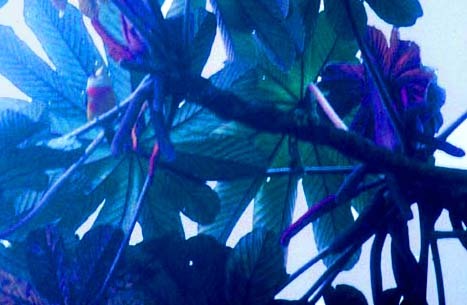 (1993) found that 100% of the stomach contents of both toucan-barbets was fruit. In this fruit-eating behavior they are more similar to toucans than to New World Barbets. Both species of toucan-barbets are unique among all barbet relatives in having the bill tip extending forward and fitting into a notch in the tip below. Young birds use these scissor-like tips to easily "bite" their way out of nesting cavities (Short & Horne 2001). This holds true for Prong-billed Barbet in the mountains of Costa Rica and western Panama. It is not as colorful as Toucan-Barbet but it does have the unique bill, as shown in this photo from Costa Rica (left). Photos: Both photos of Toucan Barbet Semnornis ramphastrinus were taken along the Nono-Mindo Rd., Ecuador. James Ownby photographed his on 8 Apr 2002 at Septimo Paraiso Resort; my distant shot was higher on the ridge and farther south along the road on 17 Apr 1992. 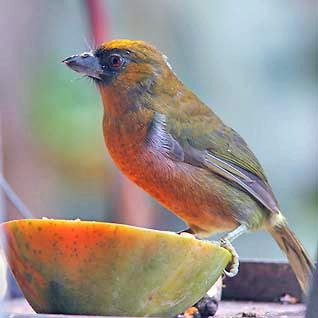 The Prong-billed Barbet S. frantzii was at Mirador Cinchona, Costa Rica, on 18 Dec 2007. Photos are © James Ownby and Don Roberson, respectively; used with permission, all rights reserved. Hyde, and A. Chapman. 1993. The diets of neotropical trogons, motmots, barbets and toucans. Condor 95: 178-192. Short, L.L., and J.F.M. Horne. 2002. 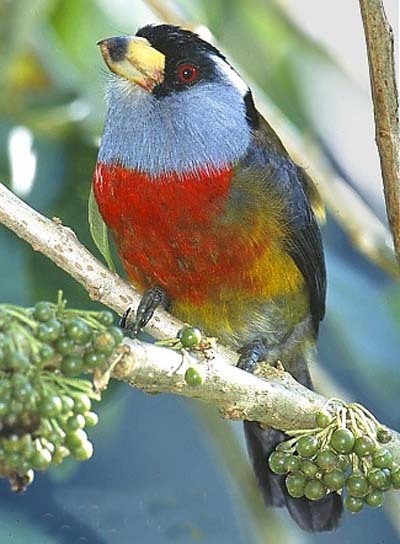 Family Capitonidae (Barbets), pp. 140-219 in Del Hoyo, J. Elliott, A., & Sargatal, J. eds. Handbook of the Birds of the World. Lynx Edicions, Barcelona.